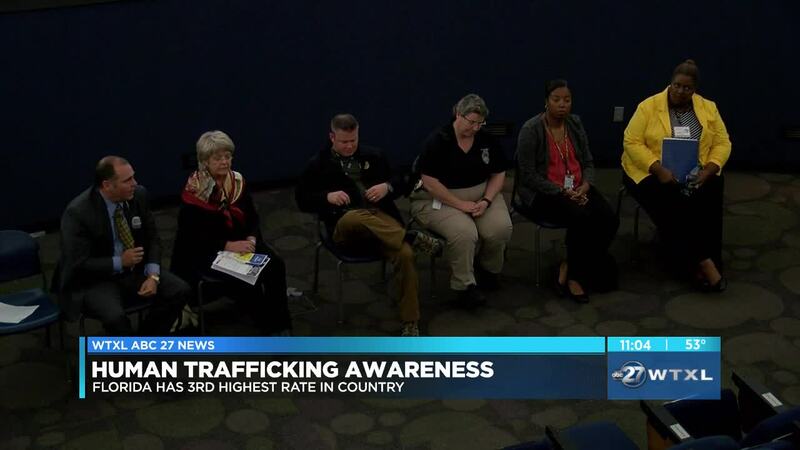 TALLAHASSEE, Fla. (WTXL) — Florida is the third highest trafficking destination in the country with half of the victims under the age of 18, according to the Florida Department of Health. That's why the Tallahassee organization, Minority Outreach Solutions, held a community event tonight to talk about how people can be aware of trafficking that could be happening around them. The goal was to give people knowledge to recognize human trafficking situations and encourage them to speak up. "We can do together what we cannot do alone. So, we thought by bringing this issue to the attention of the community, the broader community, to children who this may be happening, to people who work in education and the healthcare profession. By bringing people, just the general community, making them more aware of the issue, it would allow people who have the ability to report," said Legislative Affairs Marketing Director, Tazh Hall. Hall says human trafficking is a huge epidemic in Florida. He also says change needs to take place and he hopes by bringing attention to the community and starting the conversation, will lead people to stand up for those struggling from trafficking.